Wikipedia: The Sheep Wars, or the Sheep and Cattle Wars, refers to a series of armed conflicts in the Western United States which were fought between sheepmen and cattlemen over grazing rights. Sheep wars occurred in many western states though they were most common in Texas, Arizona and the border region of Wyoming and Colorado. Generally, the cattlemen saw the sheepherders as invaders, who destroyed the public grazing lands, which they had to share on a first-come, first-served basis. Between 1870 and 1920, approximately 120 engagements occurred in eight different states or territories. At least 54 men were killed and some 50,000 to over 100,000 sheep were slaughtered. One of the favorite tools used by the cattle industry to push competing grazing animals off the lands they covet is that of supporting outright myths and also funding questionably designed studies and then promoting the highly questionable results. Over the last century this has led to the demonizing of grazing animals that compete with cattle for forage on public lands. And sadly some of these methods and the resulting idiotic canards still permeate common knowledge in society today. This is tragic from the standpoint that, in order to manage any grazing animals, including wild and or domestic herbivores, a clear and precise understanding of each animal’s behavioral ecology is critical. These days most grazing herbivores wild or domestic have lobbies based upon an economic foundation. The economic value of cattle, sheep and swine are obvious due to the market demands for these animals as common human food sources. Not quite as obvious are the economics that support many wild animals, such as deer and elk for instance that have economic support from the hunting industry as ‘game-animals’. On the other hand, wildlife that are not seen as ‘game animals’, such as wild horses, have no such economic value placed upon them as they did in the century past when they were a key source of transportation and logistics in America. The myths herein below were relatively easily perpetrated during the time that predated the Internet, when advanced scientific information was available via relatively few and obscure resources. Today the information is available for those who are willing to spend some time to conduct some research and due diligence. Today, with the prolific publication of paleontological records of wild horses in North America and the well documented horse fossil record on the North American continent (horse fossils exist in many states), the evidence is compelling; they are native. In fact, all horses on the planet today originated from North America and migrated over the Aleutian land bridge into Asia sometime around 17,000 years ago. Dr Ross MacPhee has in fact criticized the BLM for publishing manifestly incorrect information for public viewing on their Wild Burro and Horse website. Here is the transcript of the testimony from MacPhee, curator of vertebrates at the American Museum of Natural History. Furthermore, according to Professors Kirkpatrick, J.F., and P.M. Fazio, in their article; Wild Horses as Native North American Wildlife (The Science and Conservation Center, ZooMontana, Billings. 8pp, revised January 2010): “The issue of feralization and the use of the word “feral” is a human construct that has little biological meaning except in transitory behavior, usually forced on the animal in some manner. Consider this parallel. E. Przewalskii (Mongolian wild horse) disappeared from Mongolia a hundred years ago. It has survived since then in zoos. That is not domestication in the classic sense, but it is captivity, with keepers providing food and veterinarians providing health care. Then they were released during the 1990s and now repopulate their native range in Mongolia. Are they a reintroduced native species or not? And what is the difference between them and E. caballus in North America, except for the time frame and degree of captivity? Some interesting studies have recently brought to light important details from the journals of the French explorers who penetrated more deeply onto the North American continent than any other explorers as of the early 16th century. And they in fact had made contact with the Lakota Indians who resided on the plains that stretched between the Mississippi River and the Rocky Mountains, and observed them riding horses and hunting buffalo using methods and tools (evolved spear designs) that were advanced at that place and time. The journals of these explorer-cartographers are now being studied from their secure locations in museums, where scientists have uncovered these illuminating revelations of wild horses having been tamed and ridden for centuries in America before the arrival of the French explorers in the early 1600s, thus predating the arrival of any Spaniards and even the Vikings on the North American continent. The clear implication is that the Lakota tribes had been taming and using wild horses for buffalo hunting for at least several hundred years before the arrival of the Spaniards and the re-introduction of their horses to America. Here is an interesting study that details some of these facts. There is further reading to the same point here. Another common fallacy even among hunters is that; ‘wild horses deprive deer and elk of their preferred grazing choices in the wild’. “The similarity indices and correlation coefficients show a strong potential for competition between wild horses and cattle, but little potential conflict between mule deer and the other two herbivores” [horses and cattle]. Black tail deer in western coastal areas similarly have little potential for grazing competition for foods with wild horses, hence the characterization used by wildlife biologists in regard to the co-evolutionary grazing adaptation between wild horses and cervids as being ‘commensal’; essentially eating from the same table without competing. The horse’s round hoof design allows it to ‘float’ hydraulically on the soil surface. Arguably one of the cattle industry’s favorite whoppers is that wild horses damage range and riparian lands. Cattle require extensive management to minimize the extensive damage they do to pastures and especially wetlands and riparian areas. The fact is that cattle are an invasive species imported onto the North American continent by settlers as early as the very end of the 15th century, and certainly to the Americas by the first part of the 16th century from Africa. It is important to note that there are no cattle fossils anywhere to be found on the North American continent. It is also important to note that cattle have an evolutionary adaptive hoof design that arguably provides extra traction in wetlands which are their preferred homesteads in a natural ecosystem. More detailed information and photos about the differential evolutionary adaptations between cattle and equid (horse) hooves and the impacts of those differently evolved hooves on the ranges and wetlands is found here. The bovine hoof has two pointed claws and penetrates deeply into the soil. Another damaging aspect of cattle is their multi-stomach ruminant digestive system, which is quite effective at digesting most of the plant and grass seeds they consume when grazing native pastures, rending those seeds non-viable and thereby eliminating the natural reseeding process of the plants and grasses consumed. Wild horses on the other hand have a very simple single stomach gastric system, which passes most of the seeds they consume intact and viable back onto the pastures they graze, thereby effectively reseeding the pastures. This is without doubt an evolutionary symbiotic mutualism where the plants and grasses provide sustenance for the wild horses and in-turn the horses provide a reseeding mechanism via their hummus rich droppings, which also contains nutrients valuable to the seeds when they germinate. Wild horses have many other mutualisms within the ecosystems of the American landscape, including with trees, which they adopt as their means of shelter from the heat of the summer and rains and snows of winter. In return, wild horses graze-down all of the grasses and plants under the trees thus removing that fuel for wildfires. 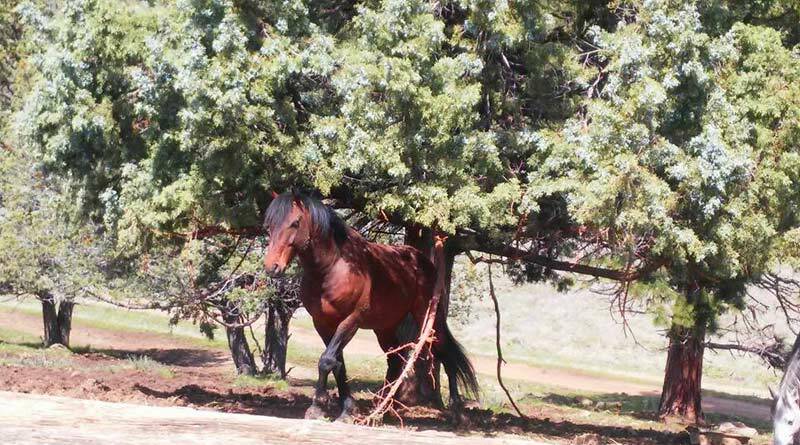 They also use the trees for scratching, and due to their height and body mass, are able to break-off low-hanging branches (fire ladders) which are subsequently broken-up on the ground by the hooves of the horses as they decompose, adding to the nutrients from the horse’s droppings, all of which build hummus and nutrient-rich soils under the trees. The results of this mutualism is that trees so adopted are made more fire resilient. And as we see in the photo below, wild horses grazing in and around forests will create ‘natural’ fire-breaks, which changes the characteristics of wildfires in a manner that benefits the forests. As we consider the foregoing it becomes strikingly obvious that the logic that follows from millennia of evolutionary processes leading to the complex mutualisms between plants, grasses and wild horses is the basis of a perfectly adapted symbiosis that cannot be duplicated be any animal(s) which has evolved in another off-continent ecosystem, such as the genetic lines of cattle that stem from African evolutionary processes. It’s a sham for any scientist to disparage or minimize the intrinsic value of wild horses to American ecosystems. So as we can now see, the cattle industry and others who repeat these myths and false narratives have done and continue to do a grave injustice to the reputation and the natural history of America’s wild horses, which have been a great blessing to mankind; literally a gift from the Creator. America was built off the backs of horses, so where would we all be today without their mutualism with man? Thank you for putting all this in one article – I have read these points individually but this helps me and others to be able to make the argument more thoroughly. Excellent article, and gives us valuable ammunition to fight for the lives and freedom of our wild horses and burros. It’s facts like these that we need, not emotional pleas. Hmm.. I must be mistaken in thinking previous information had fossils from millions of years ago found in what is now Utah and Wyoming. It’s imperative that WE ALL forward this to every one of our legislators to give them more clout. Cattle and sheep ranchers from the big livestock states have bought and paid their legislators well, and pull the strings of the BLM and DOI. Rumors abound including sending the horses in long- and short-term holding facilities to slaughter; the latest is a plan to shoot 90,000. No matter the rumors- it doesn’t look good for our wild ones. We must fight harder, and we must implore our legislators fight harder.